Bigfoot/The Yeti or Abominable Snowman as it is commonly known by, is a tall hairy apelike biped animal cryptid said to dwell in the Himalaya region of Nepal and Tibet. In the region of Nepal and Tibet it’s called the yeti and can be considered a Himalayan counterpart to the Bigfoot or Sasquatch of the United States and Canada. 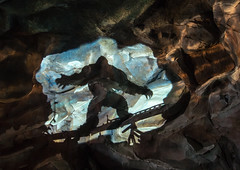 Stories of the Yeti first emerged as a facet of Western popular culture in the 19th century. Interestingly Bigfoot and Yeti are the better known species, but there are other lesser known varieties that turn up in global folklore and history under a variety of names, such as the elusive smelly red haired cousin to Yeti, the “Skunk Ape” of the swamps of the southeastern United States. So essentially “Bigfoot” and “Yeti” are different names for basically the same creature, whose alleged dwelling grounds are mostly in the northwestern corner of the United States, the southwestern corner of Canada and the Himalaya region of Nepal and Tibet for the yeti. The given name Yeti is a derivative from the Sanskrit Language (Ancient Hindu Language) which refers to “man who stays in Himalayas”. There has even been mention of Yetis in Ramayana (ancient Hindu Epic) & other Hindu epics. Even though by large, the scientific community dismisses the Yeti as a figment of imagination and a hoax supported by legend, folklore and feeble evidence, it still remains as one of the most famous, if not the most famous creature of cryptozoology ( study of unsubstantiated animals). In brief, common traits of the bigfoot/yeti are said to comprise of; strong unpleasant odors, extreme elusiveness/shyness for humans, large footprints (hence the Bigfoot name), 6-8 feet tall, 500 pounds plus, commonly depicted with white fur, although the local legends described it with reddish to brownish hair. Bigfoot/Yeti sightings, reports usually come in the form of large tracks found, alleged pelts, blurry pics taken at a distance, or rarely, actual face-to-face encounters with the creatures themselves.